Woodcuts of Conrad Black’s life probe past the simple facts to deeper impressions that flow clearly and inexorably from one to the next. Conrad Black is a difficult man to describe. He is Canadian, an author and newspaper publisher, and a convicted felon, among many other things. 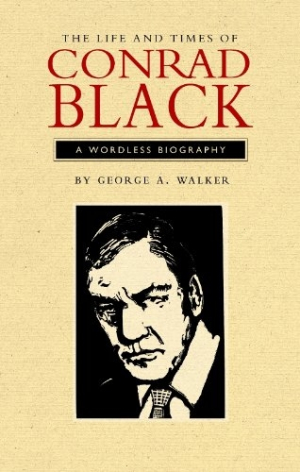 George A. Walker attempts to capture the man behind these descriptions, and also provide a sense of the scope and nuances of Black’s life, in the wordless graphic novel The Life and Times of Conrad Black. Black is undoubtedly better known to Canadians than Americans. His conviction on mail fraud charges occurred in the United States, but this isn’t what makes his story relevant outside of his home country. He is a unique figure with many aspects to his personality—intellectual and scholar, bully, and hedonist. The story of his rise and fall from grace, though distinctive in its specific details, is universal. Because Walker—an acclaimed printmaker, woodcarver, and member of the Royal Canadian Academy of Art—offers Black’s biography as a series of images, it would be difficult for readers unfamiliar with Black to understand the details of his accumulation of power, and in particular the nature of the charges that sent him to prison. Such legal complexities would be challenging to explain, or comprehend, even given an unlimited word count. (There is a brief introduction by the author, however.) Without the burden of making detailed explanations, Walker’s woodcuts probe past the simple facts, to deeper impressions that make the various points in Black’s life seem to flow clearly and inexorably, from one to the next. Using some of the many published photographs of Black as models for some of his woodcuts, Walker shows Black shaking hands or posing with a variety of dignitaries, as well as businessmen who, like Black, have garnered some level of celebrity. These public figures range from the instantly recognizable (Pope John Paul II and Princess Diana) to the lesser known (E.P. Taylor and Bud McDougald). These woodcuts show us who Black eventually became, but more interesting are those that show the path he took to get there. Among the many affecting illustrations are two showing a young Black receiving corporal punishment as a student at Upper Canada College, and another showing an older, resentful Black offering the middle finger to reporters during his trial. The Life and Times of Conrad Black is not for timid readers—not because of the content, but because of what is absent—the captions or other explanations one might be accustomed to seeing as accompaniment to such images. The book demands that its readers take the time to absorb each illustration and fill in the story around the images. Those who do that will come away with an intimate sense of who Black is, as great a testament as any to Walker’s skill in making and presenting these images.